DC Power connection, Option 2: EMI/RFI Ceramic Feed-thru. 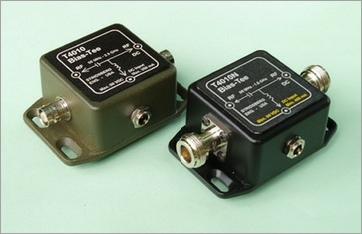 This Bias-Tee (also known as a DC Inserter) features micro-strip line construction with select components to enhance the broad-band performance in the VHF/UHF frequency range. This unit may be used with any remote device that was designed to receive DC operating power via a coaxial cable. It is housed in a cast aluminum case for ruggedness and high reliability. BNC connectors are standard, with N and TNC connectors optional. DC power (Positive or Negative polarity) is applied to the DC jack via a standard 5.5mm/2.1mm plug, a 6 foot power cord is supplied. For hard wired dc connection an EMI/RFI ceramic feed-thru with ground lug is available.